In the aviation world, all eyes are on London Luton Airport following the December 2018 opening of its upgraded terminal, which has benefited from a GBP 160 million re-development investment, the biggest in the airport’s 80-year history. With annual capacity expanded by 50%, London Luton Airport expects to welcome 18 million passengers a year by 2020 (footfall has already increased by 35% since the work began). Digitisation is now critical to the operations of a modern day airport – whether for keeping passengers informed with real time information about their flights, or driving additional revenues by attracting premium advertisers who are looking to reach a captive audience. 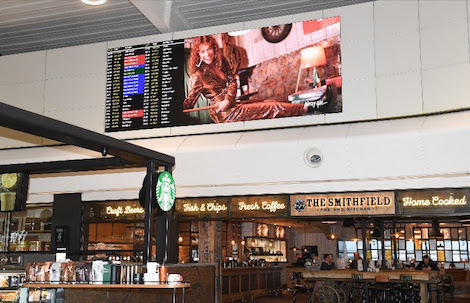 Upon the direction of integration partner SPC Group, a professional AV solution provider with extensive airport experience, London Luton Airport selected manufacturer of high quality LED displays, Absen, to deliver its digital display solutions. SPC Group chose to deploy the Absen N4, designed specifically for airport environments, in a number of locations throughout the terminal. Stand-out features such as front installation and service, an ultra slim panel (less than 6cm), advanced monitoring, image quality, and the uniformity and consistency of the image all set the N4 apart and make it perfectly suited to the modern airport environment. Luton has joined international airports in Turkey (Istanbul), Italy (Rome, Venice), Australia (Sydney, Brisbane), New Zealand (Auckland), Norway (Stavanger, Bergen, Trondheim), Finland (Helsinki) and tens of locations in the US which all boast Absen solutions, changing the airport landscape beyond recognition with performance which goes above and beyond a standard LED panel. A 7×4 N4 display is stationed at the entrance to the baggage hall, and hosts advertising for onward travel providers such as coaches and trains. A second N4 display in a 11×4 configuration is installed at the entrance to the international departures lounge, and rotates through flight departure information across 4×4 on the left hand side of the screen while the remainder is used for advertising which is relayed by the airport’s partner. At the North end of the international departures lounge above Hawker Bar, a further set up of 9×5 N4 also stages advertising run by the airport’s partner. The digital LED make a key contribution to the overall ambiance of the new terminal, which also features 30 new shops, more than 1000 extra seats, a new boarding pier and an expanded security search area. This entry was posted on Friday, March 29th, 2019 at 09:27 @435 and is filed under Scuttlebut. You can follow any responses to this entry through the RSS 2.0 feed. You can leave a response, or trackback from your own site.